I would urge readers to call this establishment to let them know that misogyny is unacceptable. 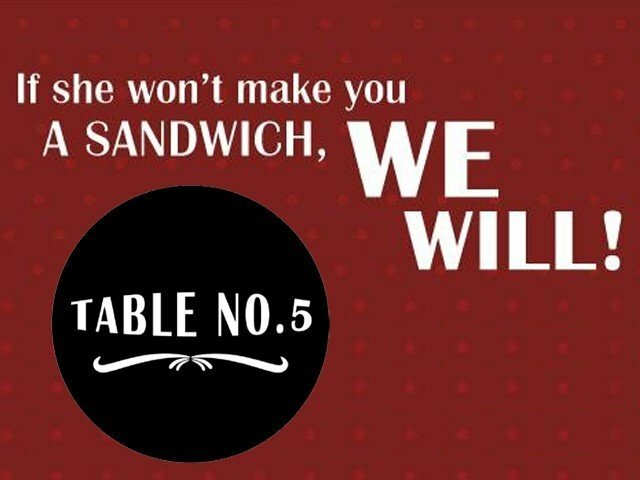 This Islamabad-based eatery is named ‘Table No. 5’, but perhaps they should call themselves ‘Mentally Unstable No. 5’. If you thought that joke was bad, then get a load of these. 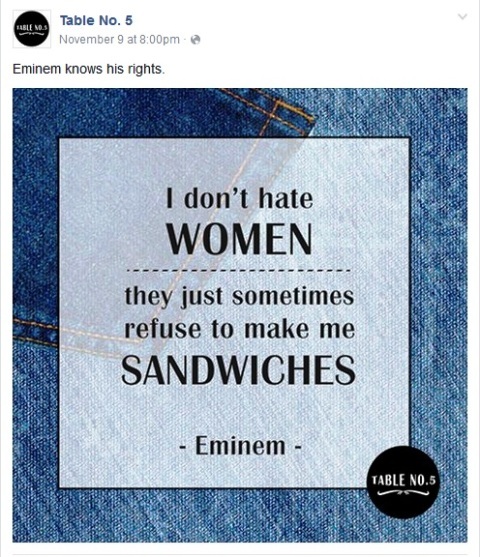 If their sexist ‘humour’ wasn’t nauseating enough, their food is named after celebrities such as Sean Penn and Bill Cosby. You know, men who have a record of physically and emotionally abusing women. And then there is Bill Cosby, who has raped so many women, he probably has a special place in the afterlife just for him. “Now, nearly 60 years since Bill Cosby’s first alleged sexual assault, a group of women who say ‘America’s favourite dad’ attacked them have come forward to reveal their harrowing experiences. 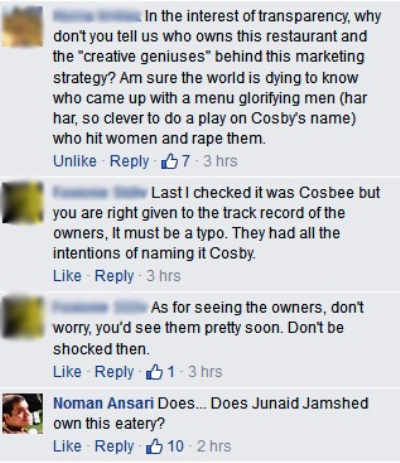 Appalled by the nasty references, Pakistani women chose to remind ‘Table No. 5’ on their Facebook page of the unacceptability of their branding. If we are expected to believe that ‘Cozbee’ is a made-up name and we are jumping to conclusions, then the owner of this restaurant is pretty bucking cupid. You can educate yourself more on this form of abuse here. 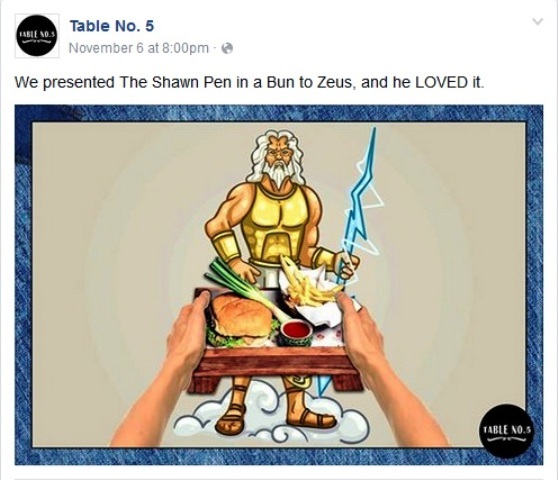 The restaurant’s badly thought-out marketing plan has given rise to a storm on social media, and for good reason. 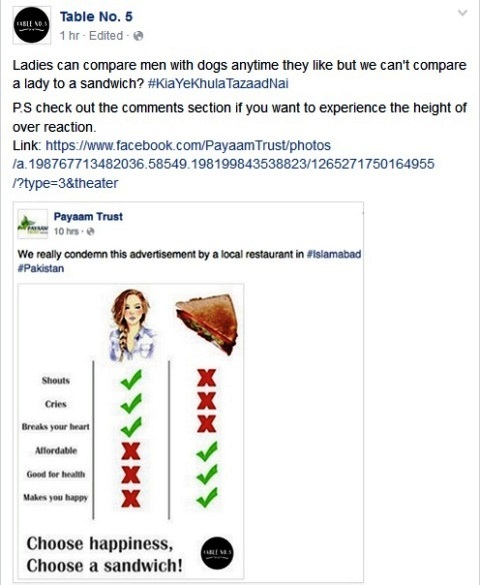 On their Facebook page alone, numerous Pakistani women have left poor reviews for the restaurant. Disappointingly, not as many men have. 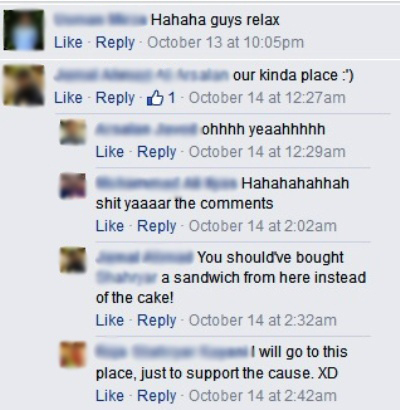 What’s worse, a minority has expressed open appreciation. Undoubtedly, some will ask why the aggrieved are protesting so passionately. Sadly, no one would have fired this query had the jokes, instead of being sexist, been racist or anti-religion. What is it about sexism that finds such casual acceptance? 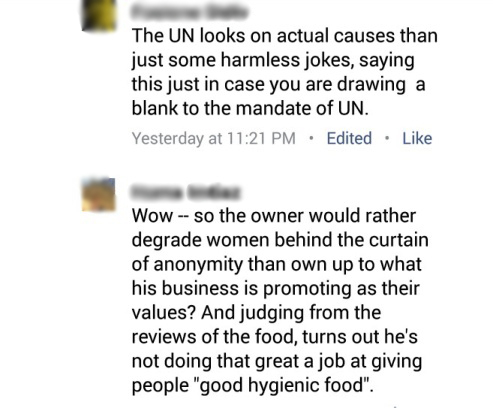 If issues such as racism and bigotry are condemned with little backlash, why does sexism draw apologists out of the woodwork? Just so that we are clear, as a feminist I am offended by sexist jokes, as a man, I am offended by sexist jokes, but most importantly, as a human being I am offended by sexist jokes. Offhanded misogyny, carefully packaged in a seemingly acceptable joke, is dangerous because it convinces some of the righteousness of sexism on a subconscious level. Equal rights for men and women can’t be achieved, when those capable of initiating change consume media that convinces them of the superiority of a single gender. Certainly, I can’t fathom why the owner of this business has decided on such a counterproductive plan. 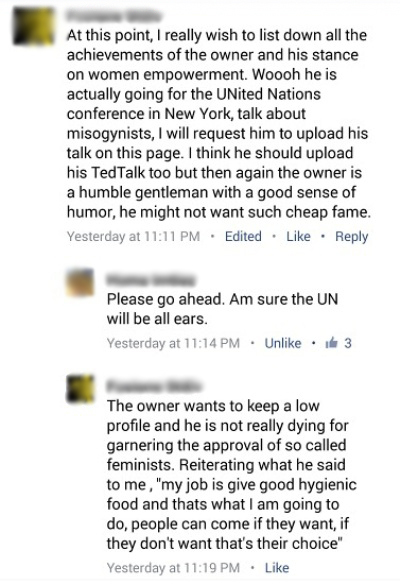 How can hatred of women override all common sense? As part of an industry that thrives on good-will, naming your food after rapists and abusers is far from a clever way to get attention. Certainly, it makes one wonder what ingredients Table No. 5 are using in their food. But please, keep it clean. Don’t drop to their level of distaste. is not that rare among men. like take aways, frozen food or other ready to cook items that are mostly fried and determinantal to health in general. I think you need a break from writing. 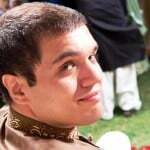 You have given us some good blogs but now you are making everything “Bilawajha ka masla”. Hi Parvez. I remember I wrote a blog on these smutty ads on Facebook which were sharing private celebrity photos and you had a similar response. 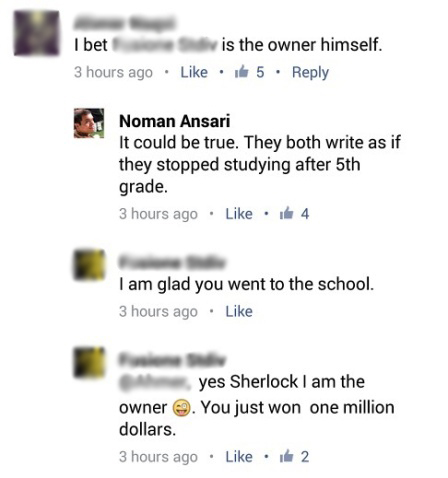 At the time I argued my blog was a drop in the bucket compared to the the exposure from Facebook alone. Keep in mind after the blog, Facebook removed those ads. No where to be seen. As for this, I believe you have this belief that no publicity is bad publicity. For many items it is true. But not in the service industry. 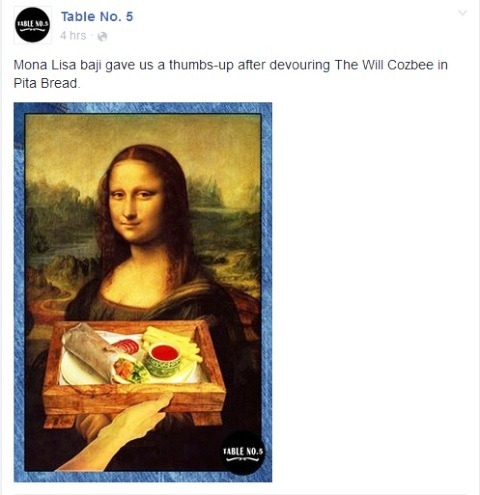 On the Facebook page of Table 5 they have issued an apology. They were visited by the police today also, according to AFP. So, no, they aren’t smiling. There are thousands of complaints. Please visit their page. Look at their messages. Does this look like smiling? To their credit, they have apologized. 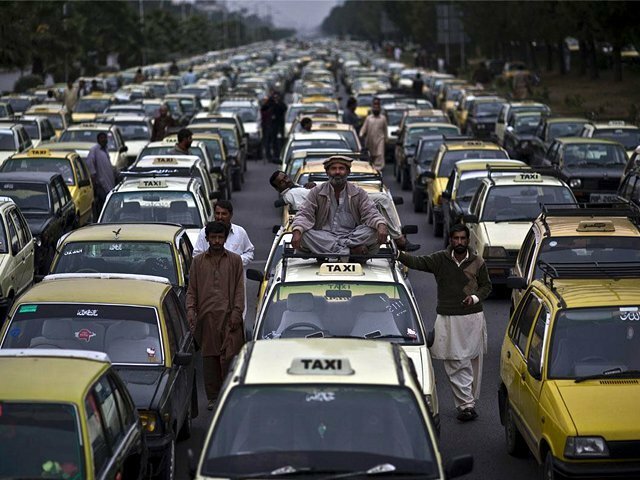 In a place like Pakistan, where the country ranks among the worst places for women, this only reinforces attitudes towards women. 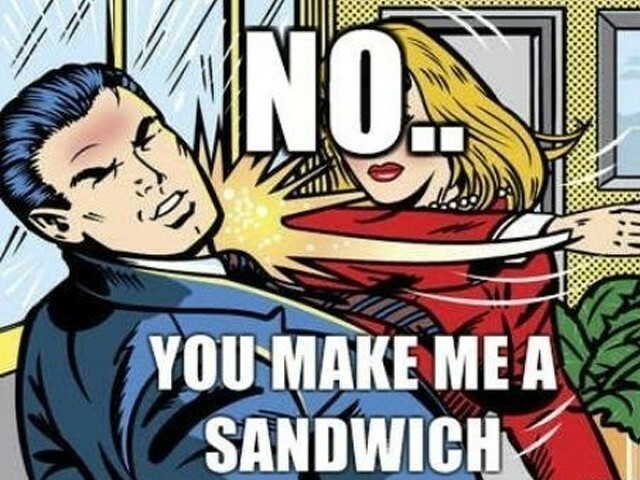 even the top cooks are men dominated.